Royoledeveloped a super thin OLED display that should work on next-generation smartphones. The material is just 0.01-millimeter thick and so thin it can flex, fold, and flap, according to CNET. At the IFA conference in Berlin, Royole plans on introducing its flexible phone. Royole's flexible displays are produced at the company's 1.1-million-square-foot Gen 6 mass-production campus in Shenzhen, China, a 100% self-designed, R&D and manufacturing facility with a total investment of around $1.7B. 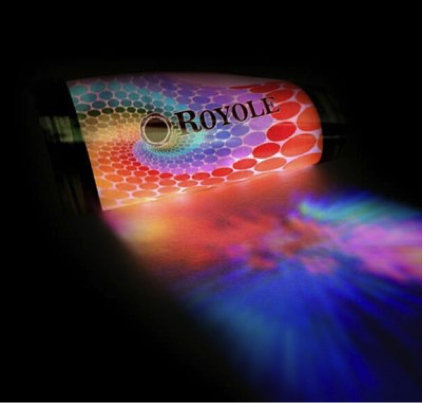 Royale claims a unique fab technology that is having the capex of a typical Gen 6 OLED fab. Royole’s bendable phone design envisions a wraparound device used straight, like a traditional smartphone, or bent to fit around the wrist. As the CNET reporter explains, “I briefly took a look at Royole’s displays up close, and while they weren’t touchscreens, they were indeed, vibrant and have a sharp 200-to-300 pixel per inch density. They were also very light. The first Royole flexible phone probably won’t come cheap. The company’s first flexible t-shirt, out in November, costs $900. It’s so-called 3D Mobile Theater gadget is priced at $800.